Classes meet at the Magnolia Center, 601 Grand Avenue in South San Francisco. You can register online here. I will also have a few registration forms in class on the first night but the office really prefers for you to register online. I wish everyone a wonderful 2019. → Click here to receive blog posts by email. Here is a really cute performance by Egyptian belly dancer Shu Shu Amin (شوشو امين). I wish there were more clips of her online! I love how her performance here manages to be both high energy and yet subtle. And I love her beautiful musicality too! This is bellydancer ShuShu Amin performing in a scene from the 1979 Egyptian film ‘Sa’aktob ismak ala al ramal’ (I’ll Write Your Name in the Sand’ سأكتب اسمك على الرمال ). ShuShu Amin only danced in three movies and if you’re a dancer, you’ll wish they’d spent more time filming ShuShu and less time focusing on the actor Ezzat El Alaili looking shifty and/or murderous. The film also starred Nahed Sherif and Samira Said. The informative caption is from The CaroVan, where you can always lose yourself and hours of time in amazing belly dance videos! There is more information about Shu Shu Amin here on the Serpentine website. A couple reminders: my summer classes started last week but you can still join by calling the SSF Parks and Rec office: 650.829.3800. There is plenty of time to join the fun. My next performance will be at Tannourine Restaurant on Friday, July 6th. Details on my Shows page. Just a quick update this week to let everyone know that the Summer Session of belly dance classes at the South San Francisco Parks and Rec starts next Wednesday, June 20th. Beginning Bellydance is from 7 - 8 and Intermediate is from 8 - 9. Classes go through Wednesday, July 25th and there is no class July 4th. You can register online through the SSF Parks and Rec in plenty of time to join us for a fun summer session. Let me know if you have any questions. And then for something completely different :). I got to perform at Al Masri last Sunday with Nazir Latouf and the Al Masri Passion Band and my lovely friend Joumana took a video so I thought I would share it here. The musicians are Musa Sababa on keyboard, Nazir Latouf on the oud, Reda Darwish on tabla and Linda Grondahl on backup percussion. The music is incredibly beautiful - we are so lucky to have these musicians in the Bay Area and I encourage everyone who loves belly dance and Arabic music to come out and enjoy one of these nights! I hope you all enjoy the music and I wish you a great week! A couple weeks ago I was looking at the YouTube page of Sausan's Academy of Egyptian Dance and stumbled across a very cute clip of Egyptian belly dancer Hoda Shams El Din (هدى شمس الدين). This is a very frank and important observation from a dancer who has been deeply involved in the Cairo scene. I am mentioning it because this is precisely why I like to share vintage or classic Egyptian style belly dance clips on my blog and why I also try to support other artists who share the same respect and love for the roots of the dance. I feel that someone new to belly dance could go onto YouTube and look for clips and get a completely skewed idea of what the dance is, and perhaps be discouraged from trying it. Some of the clips out there make the dance look much too gymnastical (is that a word? ), technical or impossible for the average person to do, and I fear women could be discouraged from trying. I always hear the words of my teacher Amina in my head when I would start to get to wrapped up in this kind of thinking. She says, "It's a folk dance." That means it is not only for someone with elite training. Anyway, I highly recommend the whole interview with Luna of Cairo for a great read. It sounds like she will be teaching workshops now that she is home from Egypt, so here's hoping that San Francisco is on her list. Follow Luna here to stay up-to-date. And so back to the clip I started talking about! Sausan is another artist I admire so much- she is the owner and head chef of Al Masri Egyptian Restaurant (where so many of us in the Bay Area LOVE to dance, watch dance and listen to live Arabic music!) and also runs the Sausan Academy of Egyptian Dance. She has taken many film clips of dancers and created DVDs of them categorized by dancer- she has translated many of the songs into English and subtitled the DVDs so it's quite valuable - you can see her collection here. ©SAED Hoda Shams El Din was born of Armenian parents. Her first appearance on the silver screen was in 1950 as a dancer. She later starred and danced in a movie called Halal Alayk (You Really Deserve It) with Ismael Yaseen in 1951 and continued to appear as a dancer and actress until the mid 1960s. You can see more of Hoda Shams El Din on the CaroVan Vimeo Page. And you can learn more about her at this really fascinating article on The Belly Blog. Lots of news for this week too: first of all I get to be part of not one, but TWO live music and belly dance shows this weekend! Tomorrow (Fri 6/1) I will be at Tannourine Restaurant in San Mateo for a live Arabic music and dance with Khalil Abboud and Band. Live Music and Belly Dance Show at Tannourine in San Mateo on Friday, June 1st! 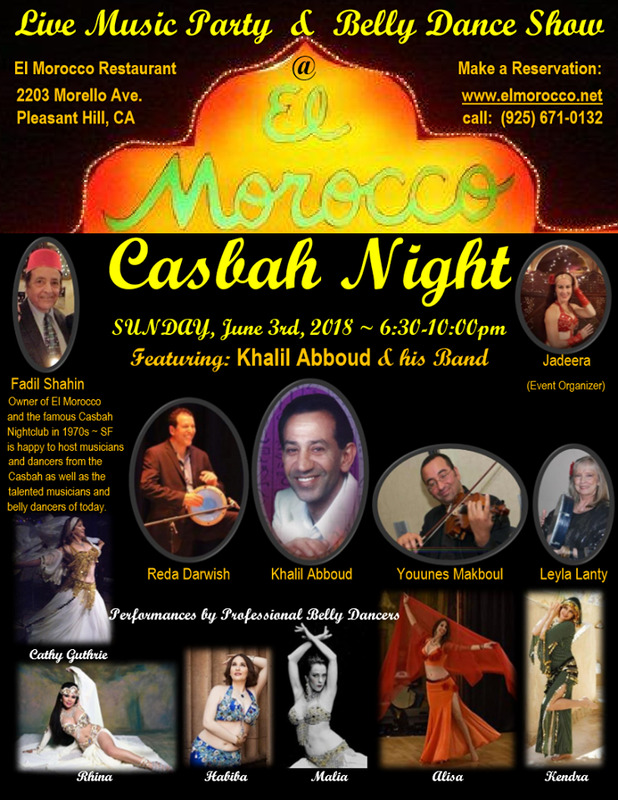 Beautiful Live Music and Belly Dance Show at El Morocco in Pleasant Hill - Sun June 3rd!! Details for these and other performances are on my Shows page! And then I will be teaching belly dance for the Summer 2018 session at the South San Francisco Parks and Rec - you can register easily online! 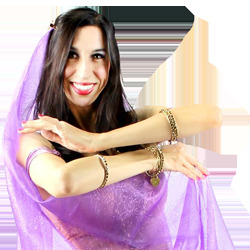 Belly Dance Classes in South San Francisco! Complete class information on my Classes page. Thank you so much for reading, I hope you find a class, clip or show that you will enjoy and I will see you next time :) Happy Dancing. Today I wanted to share a few of my photos from the Rakkasah West Festival in Concord, CA last month. Rakkasah is the first of the bellydance festivals in the US and I believe it is still the biggest. It is always an inspiring and fun day! This year I was incredibly fortunate to get a slot with one of my favorite bands, Pangia. They play classic American-style belly dance music, which is really a blend of many traditions- Arabic, Turkish, Greek, Armenian etc. One more at Rakkasah West 2018 with Pangia! Finally, I also wanted to share a bit of the tribute to Zelina/Elaine that I mentioned in my previous Rakkasah post. This is the last minute or so of the show where we all blow are dear friend a kiss. (The great music is Kuli Banat by Nazir Latouf). I was so happy I got to be a part of this celebration of our beautiful friend and her love of dance. The last 1.5 minutes of El Asaab's tribute to Zelina/Elaine Arneson at Rakassah West 2018, where we blow are dearly missed friend a kiss. I'll just close with a few reminders! My summer belly dance classes at the South San Francisco Parks and Rec will start on Wednesday, June 20th. You can register online at the brand new SSF website here. If there are any problems you can call the office at 650.829.3800. Complete class information is available on my classes page and you can also always contact me! And then I will be performing at Tannourine Restaurant in San Mateo to live Arabic music as part of a belly dance show put on by the one and only Khalil Abboud and band on Friday, June 1st. Complete information about the show is on my Shows page. Welcome to my blog! My name is Alisa and here I write about Egyptian and American styles of belly dance. I share a new post every Wednesday. Thank you for visiting!